The Premium Series Severe-Duty HydroRam hydraulic hammers were featured at the AED Condex show recently held in Orlando FL. Ron Johnson was able to meet personally with customers, both established and new. 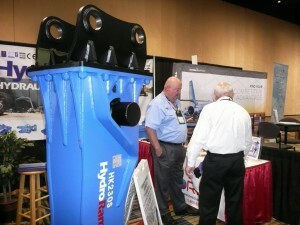 He was on hand to explain the benefits of this innovative and durable hydraulic breaker. Thank you to all of the many customers that stopped by to say hello. Thank you to our new customers that will soon be breaking rock with this big blue beast! If you need information about the Premium Series of hydraulic hammers, please call us at 1-888-651-0187 or visit our hydraulic hammer page today.